Seamless handover in wireless networks is to guarantee both service continuity and service quality. In WiMAX, providing scalability and quality of service for multimedia services during handover is a main challenge because of high latency and packet loss. In this paper, we created four scenarios using Qualnet 5.2 Network Simulator to analyze the hard handover functionality of WiMAX under different conditions. 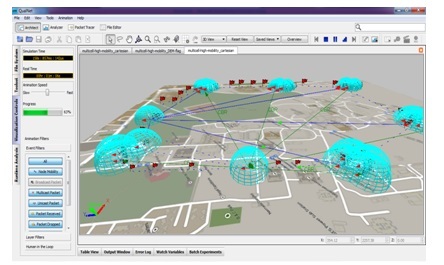 The scenarios such as Flag with 5 and 10 sec UCD and DCD interval values, Random mobility scenario and DEM scenario using 6 WiMAX Cells have been considered. 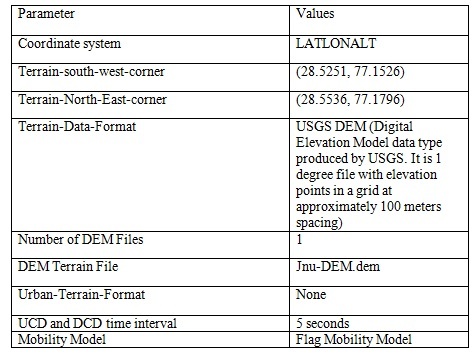 This study is performed over the real urban area of JNU where we have used JNU map for scenarios 1, 2 and 3 but for scenario 4, the JNU terrain data has been used. Further, each BS of 6 WiMAX cell is connected to four nodes. All nodes of each scenario are fixed except Node 1. 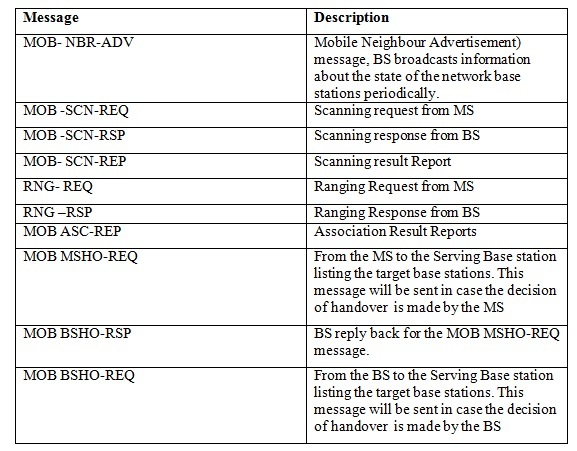 Node 1 is moving and performing the handover between the different BSs while sending and receiving real time traffics. Flag mobility model is used in Scenario 1, 2 and 4 to model the movement of the Node 1 while we use random mobility model in sceanrio3. 5 seconds time interval is used for Scenarios 1, 3, and 4 while 10 seconds time interval is used for scenario 2 to study the effect of management messages load on handover. Further, the statistical measures of handover performance of WiMAX in terms of number of handover performed, throughput, end-to-end delay, jitter, and packets dropped are observed and evaluated. Worldwide Interoperability for Microwave Access (WiMAX) brings broadband experience into wireless context . It is an emerged industry based standard technology to provide a cost effective alternative solutions to the high cost wired broadband technologies available nowadays like DSL, T1/E1, and cable modems . WiMAX is based on IEEE802.8 family of standards for providing wireless broadband connectivity over a metropolitan sized network and in two possible developments . They are fixed WiMAX which is based on IEEE802.16d 2004 and Mobile WiMAX that is based on IEEE802.16e 2005 . Broadband provides end users with certain benefits for traditional services and new multimedia services as well. Broadband systems must provide these benefits with a robust QoS in terms of throughput, jitter, End-to-End delay and packet error rate . Mobility on the other hand is the most advantage provided by Mobile WiMAX to end users , but it brings main challenges like the need to address two important issues for supporting mobility; they are roaming and handover as well . Roaming and Handoff are what we mobility management should take care of . It should find means for supporting roaming and making seamless handover as well. As for a seamless handover, how to maintain on-going sessions without it being interrupted while on the move even with a vehicular speed is a serious challenge . This serious challenge rises on how and when to make the transition process . Algorithms which are responsible for taking the decision on when to make the handover needs to assure the balance between handoff rate and the dropping probability . So, serving multimedia applications while on move and with a certain levels of QoS is more challenging because of the time variability and channel unpredictability and the situation became more critical when doing the handoff from one cell to another . Handover in WiMAX is classified into three types; they are hard handover (HHO), Macro Diversity Handover (MDHO) and Fast Base Station Switching (FBSS) . Hard handover is mandatory in WiMAX systems. The other two types of handover are optional . During hard handover, the MS communicates with only just one BS each time. Connection with the old BS is broken before the new connection is established with the new serving base station. 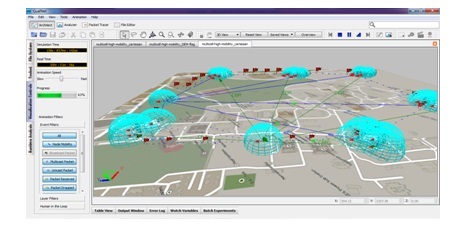 In this paper we do a performance evaluation of the basic handover of WiMAX in multi-cell environment with high mobility for Real Time Traffic . The contribution of this paper is to evaluate the performance of hard handover functionality of WiMAX under different conditions and in terms of number of handover performed, throughput, end-to-end delay, jitter, and packets dropped for real time applications. The rest of this paper is organized as follow: section 2 defined the hard handover in WiMAX; section 3 outlines some of the related work done in this area of research. The detailed simulation setup has been described in section 4, whereas section 5 explains the results analysis. Finally this study is summarized in section 6. Table 1. Handover Messages Description. Handover is an important issue to be tackled when providing Multimedia applications over wireless broadband networks. How to make the handover between WiMAX BSs was studied in  to ensure providing seamless handover for multimedia applications, S. K. Ray et al. presented the issues related to handover along with suggesting different solutions to face these issues and challenges. In  Pero et al. discussed the effect of handover on the performance of Mobile, WiMAX. They concluded that handover latency and dropping rate have a significant influence over the performance. In  Zina et al. in their paper studied handover issues and its effect on multimedia traffic, while presenting a MAC layer solution for optimizing handover for video applications in WiMAX. Their solution reduced the scanning time pre handover through the process of eliminating the number of scanned BSs according to different parameters like required bandwidth support. In  Po-wen Chi et al. proposed a fast and controlled handover scheme to decrease handover procedure and according to the results presented in the work the proposed scheme outperforms the default one. G. Khishigjargal et al. in their paper  defined the procedures of MBS handover. They evaluate the performance of WiMAX under conditions related to MBS handover for mobile IPTV in Qualnet simulator. Performance metrics are handover latency and data loss. 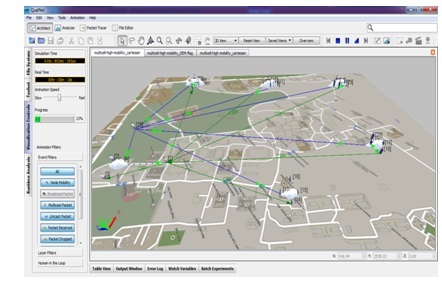 We created Four WiMAX scenarios using Qualnet 5.2 Network Simulator to test the basic handover functionality of IEEE 802.16e in multi_cell environment and, high mobility for real time applications. The created scenarios are composed of six subnets; each has 4 nodes connected with a BS. Nodes 4, 5, 10, 13, 17, and 21 in each scenario are the BSs of these six subnets, as it is shown in the Table 2. 5.1. Scenario 1: is shown in Figure.2 we have placed six BS over 2000 x 3000 area considered to be the area of JNU, Jawaharlal Nehru University. Node 1 is moving according to flag mobility model. The scenario specific parameters are listed in the Table.4. Results of scenario 1 is compared with results of scenarios 2, 3, 4 for studying the effect of load of management messages, Mobility model, terrain on the number of performed handover, respectively. 5.2. Scenario 2: is shown in Figure.3 we have placed six BS over 2000 x 3000 area considered to be the area of JNU, Jawaharlal Nehru University. Node 1 is moving according to Flag mobility model. The scenario specific parameters are listed in the Table 5. 5.4. Scenario 4: is shown in Figure.5 we have placed six BS over the area of JNU. Using JNU DEM data for terrain. The specific scenario parameters are listed in the Table 7. 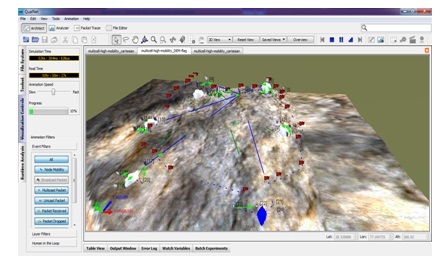 We discuss simulation results, number of handover performed; throughput, end-to-end delay, and jitters as follow. In the first two scenarios (Table.8, Table.9) changing the interval time of receiving UCD and DCD is not affecting the number of handover performed. We start by sending 100 packets for each running application; we keep Node 1 busy in transmission and receiving till the end of simulation by changing the interval time between the generated packets. Since the interval for 100 is long, the node will have longer time of pausing before retransmitting, therefore the number of handover is less. By increasing the number of packets into 500 the number of handover performed is increased in the first two cases and remains constant while increasing the number of packets in the multiple of 500, i.e. 1000, 1500, 2000, 2500, and 3000. In case of Scenario 3(Table.10), where the random mobility model is used, the number of handover performed is fixed for the varying number of sent Packets. It is due to the random movement of Node 1 and the position of node from the base station is affecting the possibility of executing handover. 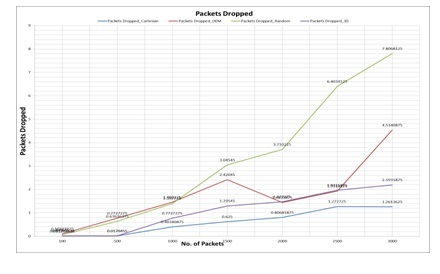 In scenario 4(Table.11), the number of handover is same for the first two cases where the number of packets sent was 100 and 500, and then it increased with increasing the number of packets sent and remained constant. Throughput refers to the rate of information arriving at or passing a particular point in the network. It is the total amount of data at that point divided by the time it takes to get the last packet. It is measured in bits per second  (bit/s or bps). In case of Scenario 1 and 2 where the used value for UCD and DCD intervals are 5 and 10 seconds, the number of performed handover is same in varying number of packet sent shown in tables 7 and 8. 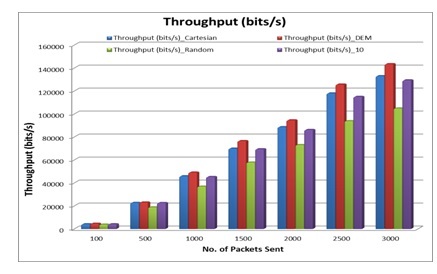 The only difference in both the scenarios was in throughput where throughput of scenario1 is higher than throughput of scenario 2, due to the number of packets dropped in 10sec is more compared to 5sec depicted in Figure 6. The throughput for scenario-3 where random mobility model is used to model the movement of Node1, is less than throughput in Scenario 1 with flag mobility model, shown in figure 6, because the node 1 in Scenario-3 is getting away from the base stations and failing to make handover , therefore the larger number of packets are dropped. In case of Scenario-4 where DEM data is considered, its throughput is higher than the throughput in Scenario 1 where the elevation of node is not taking into consideration. Jitter can seriously affect the quality of services. “It is the variation in delay of different data packets that reach the destination. For varying number of packets the jitter is more when the number of packet sent is less. 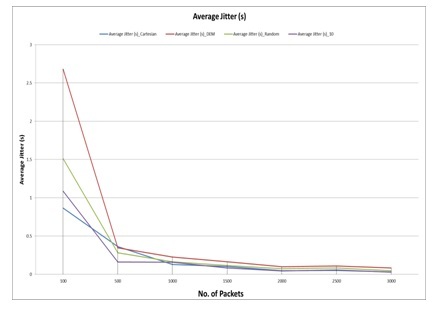 From the Figure.7 the value of jitter in all scenarios is very high when 100 packets are sent, then it goes down when 500 packets are sent, and it becomes almost constant with increasing the number of packets, i.e. 1000, 1500, 2000, 2500, and 3000. In case of sending 100 and 500 packets the interval between the packets sent is large which causes the interval between the variations in delay of the received packets to be larger than the other cases of number of packets sent where the interval between packets sent is smaller. In scenario-1 the jitter in case of 100 packets is less than jitter in Scenarios 2, 3 and 4 then it goes higher than scenario 2 and 3 in case of 500 packets sent, but for 1000 packets, jitter becomes less than both scenarios 2, and 3. Then it remains constant for varying number of packets. Jitter in scenario 2 is higher than jitter in scenario 1 only for 100 packets, and then it goes down for the varying number of packets. In scenario-3 the number of handover performed is not changing at all along with changing the number of packets sent, but the jitter is higher in case of 100 and 500 packets sent. Whereas, scenario-4, has always higher jitter compare to the other scenarios, because of the variation in the terrain and then the variation in the delay of received data. Similar to other scenarios, scenario 4 also remains constant for the varying number of packets after 500 packets sent. End-to-end delay indicates how long or how much time units it takes for a packet to travel from the source to the destination. “It is the average data delay an application experiences while transmitting data given by . Initially end-to-end delay (Figure.8) of scenario 1 is low compare to other scenarios in 100 number of packets sent, but it goes very high when the number of packets increase to 500. Later it fluctuates for the remaining varying number of packets, therefore, there is no pattern performed by scenario 1. 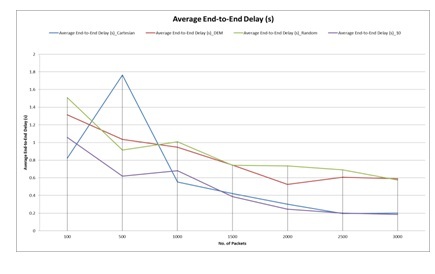 Similarly in the case of scenario 2, 3 and 4, end-to-end delay fluctuate with the varying number of packets, thus it is difficult to conclude the significance of mobility mode, UCD and DCD interval values and terrain on the network performance in terms of delay. In all scenarios the values of delay is higher to support rtPS data. Packet loss is another important performance metric for handover, in scenario-1, the packets dropped is less than the other scenarios in all the cases, whereas, scenario 3 has the highest packets dropped (Figure.9). Scearnio-3 is the only scenario, whose number of packets dropped increased with the varying number of packets till 1500, after that it fluctuate. The number of dropped packets in scenarios 1, 2 and 4 is increasing with the varying number of packets. In this study, the real urban area that is our university, JNU is considered for the WiMAX handover performance. Four scenarios such as Flag with 5 and 10 sec UCD and DCD interval values, Random mobility scenario and DEM scenario have been created using Qualnet Simulator. Further, the statistical measures of handover performance of WiMAX in terms of number of handover performed, throughput, end-to-end delay, jitter, and packets dropped are observed and evaluated. The obtained results indicate that the performance of handover in terms of number of handover performed and packets dropped is affected by the load of management messages, mobility model of the moving nodes and the variation of terrain data. Depending on this analysis we see that handover is affected by the mobility pattern and terrain variation more the load of management messages. The delay, jitter and packets dropped are high to support real-time application. Rao, GSV Radha K., and G. Radhamani. WiMAX: a wireless technology revolution. CRC Press, 2007. Andrews, Jeffrey G., Arunabha Ghosh, and Rias Muhamed. 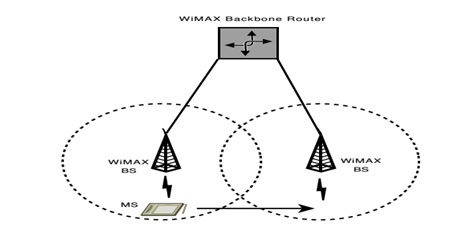 Fundamentals of WiMAX: understanding broadband wireless networking. Pearson Education, 2007. Etemad, Kamran. “Overview of mobile WiMAX technology and evolution.” IEEE Communications Magazine 46.10 (2008): 31-40. Eklund, Carl, et al. “IEEE standard 802.16: a technical overview of the WirelessMAN™ air interface for broadband wireless access.” IEEE communications magazine 40.6 (2002): 98-107. Ahmadi, Sassan. 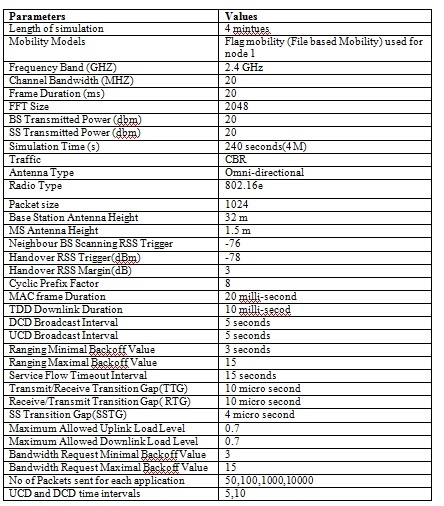 “An overview of next-generation mobile WiMAX technology.” IEEE Communications. Li, Bo, et al. “A survey on mobile WiMAX [wireless broadband access].”IEEE Communications magazine 45.12 (2007): 70-75. Jain, Raj. “WiMAX system evaluation methodology v2. 1.” WiMAX Forum. 2008. Ray, Sayan Kumar, Krzysztof Pawlikowski, and Harsha Sirisena. “Handover in mobile WiMAX networks: the state of art and research issues.” IEEE Communications Surveys & Tutorials 12.3 (2010): 376-399. Lin, Yu-Hsiang, et al. “Fast Uncontrolled Handover scheme for WiMAX: infrastructure networks.” International Journal of Autonomous and Adaptive Communications Systems 4.3 (2011): 237-251. Amira is pursuing Ph.D in Computer Science and Technology from School of Computer an d Systems Sciences, Jawaharlal Nehru University (JNU), New Delhi, India. She pursued her M.Tech (Computer Science and Technology) from JNU, in 2011, Information Engineering from Tishreen University, Lattakia, Syria in 2007 .Her area of interest includes Computer Networks, Wireless Networks, and broadband Networks.